I just got a great shirt from Natty Shirts! Nice fabric – I chose 100% super fine Egyptian cotton weaved in 100 single cotton yarn and mercerized for zero shrinkage and a silky smooth feeling, and only $99. Removable plastic collar stays and an extra metal pair was included. Seven front buttons. There are some excellent choices of collar, placket, sleeve cuffs, and fit styles. 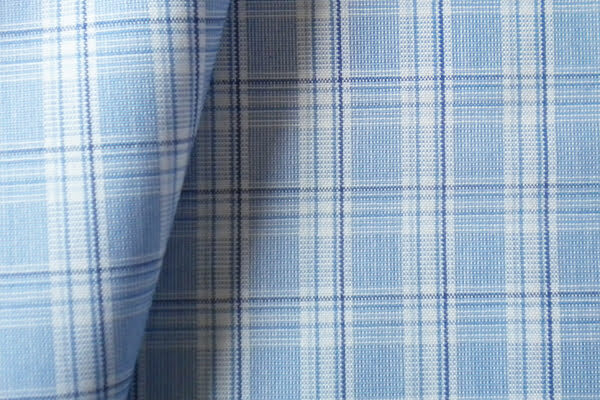 The selection of details you want for your shirt and entering your measurements is easy on the website. Some minor disappointments were the location of the monogram. I had requested it on the pocket but it was on the right cuff. As you know I consider cuff monograms as crass! Since I requested no pocket that might have confused them. MOP buttons – the really thick ones. I know you guys like them but I find them hard to button. The ones for the shirt cuffs are impossible to button with the shirt on. But I evidently made a mistake in the size when I entered the cuffs and they are big enough to put on without me unbuttoning them. (My fault). Natty Custom Dress Shirts do not charge any premium for product features because they are standard on all Natty Dress Shirts. They offer luxury features such as single-needle stitching, 20 stitches per inch, and bamboo cotton’s German fused collar with removable collar bone which gives you a true shape of collar. Natty shirts provide its customers with more than 120 fabrics in Plains, Checks, Stripes and Poplin patterns, from amongst the finest European weavers. Natty Shirts has developed strong connections with world’s renowned Tailor Made Clothing companies to share the sense of exclusivity. They’ve been around since 2003 but went online in 2010 for better customer convenience. Natty reviews each and every individual pattern before sending into production. They have four offices and admit they “are in a continuous process of learning in perfecting the custom shirt according to the sizes provided with the least amount of issues for our members”. Natty shirts are also trying to provide the fastest delivery service in the custom made dress shirt industry — within 7 business days!